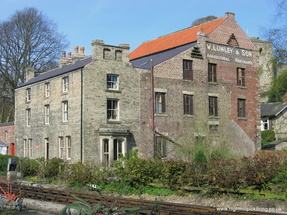 High Mill four star self catering accommodation in Pickering, UK. Four-star family run self-catering accommodation built around the historic High Mill, alongside the North Yorkshire Moors Railway (NYMR) and adjacent to Pickering Castle and the tranquil North York Moors, yet only a short walk from the town centre. If you have any queries, don't hesitate to ring or email us - we're here to help. High Mill House sleeps up to 12 - ideal for family and friends to get together, while the cosy The Limes Cottage sleeps 2. An excellent holiday location with easy access to the inspirational North York Moors National Park, the nationally renowned Dalby Forest cycling and walking trails, coastal resorts of Scarborough and Whitby, shops, traditional market towns, castles, abbeys and historic houses, theme parks and museums.